The challenge to the Minnesota law first arose in the run-up to the 2010 elections. A coalition of conservative political groups produced buttons that they intended to wear on Election Day. The groups supported voter ID laws. Prior to the election, the groups asked a federal judge to invalidate a portion of the Minnesota law that banned the wearing of a political badge, button, or insignia at a polling place on Election Day. The judge refused to block the law. Election officials responded to the legal challenge by enacting a policy that enforced a broad reading of the ban to prevent the wearing of the “Please I.D. Me” buttons, tea party T-shirts, and all other political messages. During Election Day voting, at least three individuals were asked by poll officials to remove or cover their messages or face punishment. 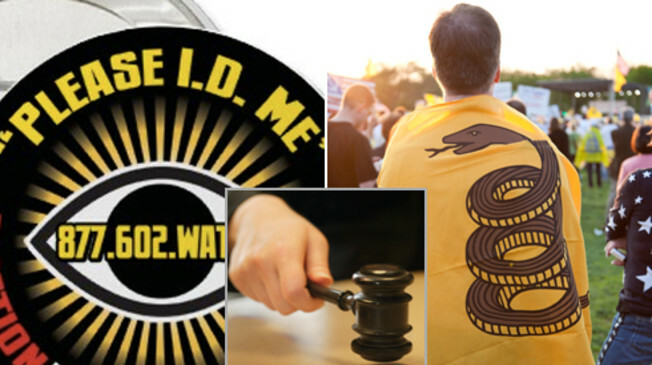 The lawsuit was filed by various conservative political groups, including the Minnesota North Star Tea Party Patriots, that complained the law would prevent voters from wearing T-shirts proclaiming “Don’t Tread on Me” and buttons urging election officials to check voters’ identification. “On its face, the contested Minnesota statute opposes all political content of apparel; thereby the Minnesota statute covers the universe of expressive activity,” Minneapolis lawyer Erick Kaardal wrote in his petition urging the court to take up the case. A federal judge threw the lawsuit out, and a federal appeals court panel agreed. The Eighth Circuit Court of Appeals ruled 2 to 1 that polling places were not locations open for public debate so the government could justify some restrictions on free speech. State officials say the statute barring political messages is a reasonable regulation of speech at a polling place. It imposes a neutral requirement that applies to everyone equally, they say. In upholding the law, the Eighth Circuit panel said the statute was justified in restricting messages about any political campaign at a polling place. The appeals court was less explicit about whether broad application of the statute to restrict noncampaign messages that do not seek to persuade or influence voters would also be justified. But the judges noted that other courts have upheld such broad bans on noncampaign-related speech. At this point, it would appear that any future disputes arising from this uncertainty will be dealt with on a case-by-case basis. So, while the Supreme Court’s action puts election officials in the clear for now, it does not foreclose future challenges arising from claims that the law is being enforced unfairly. With a statewide election (including a campaign for Secretary of State) on the calendar for Minnesota in 2014, don’t be surprised if this issues pops up in polling places – and then courtrooms – in the near future. Be the first to comment on "U.S. Supreme Court Declines Minnesota “Please I.D. Me” Case, Lets Polling Place Restrictions Stand"